Holmestead Dairy of Anola Manitoba recently achieved record milk production with its DeLaval VMS (voluntary milking system) shortly after transitioning from a double-4 milking parlour to the robotic milking unit. Jon Meinen, Herd Management Advisor with Tristar Dairy Systems, shared the remarkable accomplishment, which he states is, "not a one-off occurrence" on this dairy. "Cows should be able to eat, rest and milk when they want to. 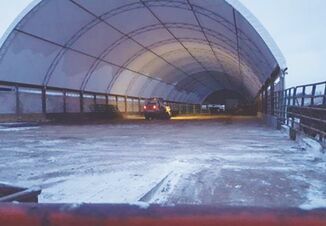 This farm's free-flow barn design allows a cow to express her natural behavior in a comfortable stress-free environment." 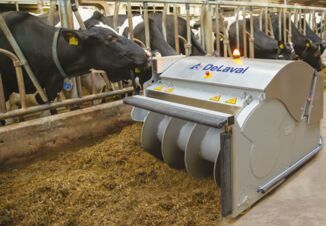 Farm owner Russ Holme credits the combination of the DeLaval VMS and Meinen's herd management support for his dairy's significant milk production increase. Holme's herd of 53 Holstein cows adapted well to the robotic milking system, installed in March of this year hit an average of 129.14 lb. of milk per cow in one day, with one cow achieving 206.8 lb. Before the robot, Holmestead Dairy was producing an average of 83.6 lb. per cow per day in their conventional parlor. What's more, milk quality has improved thanks to intense herd management support and a commitment to producing a premium product with optimal milking performance. The herd continually maintains a 45,000 somatic cell count (SCC) average. The decision to move to robotic milking has proved that quality and production can be achieved with this system, something that Holme prides himself on achieving. "The decision to move to robots was one of our best decisions. The cows absolutely love their new casual, relaxed environment and so do I. I would even dare to say, if you took away my robot, you can have the keys to my farm‚...it's that good." 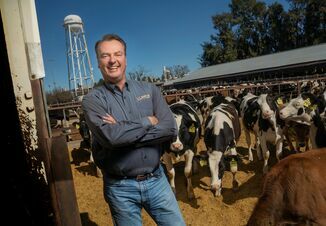 Russ Holme was born and raised on a dairy farm 39 years ago in Grunthal and is a 3rd generation dairy producer. In 2013, Russ and his wife Crystal purchased the current farm in Anola Mb. Together they own Holmestead Dairy with their two children Treston and Laynee Holme.